When everything you know and think you are is stripped from you; when you feel isolated, lonely even in a crowd; when you feel like you are holding on to the promises of God by a small thin thread, that is the wilderness. 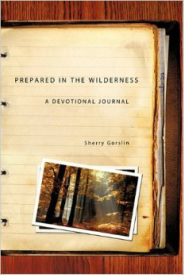 The wilderness is a season of testing, trials, and fiery furnaces always purifying you. Although the Lord spoke to me through out this time, always uplifting me as you will read, the road was never the less rough, difficult, lonely, barren, and hard. It was a journey that started with pain and hurt, but ended in joy and peace; a journey of growing closer to Him. If you will allow me to I would like to walk with you and our Lord as you take your journey. Sherry Gorslin serves as co-pastor, with her husband, at Truth Ministry in Glendale Arizona. As a Registered Nurse and Women's Health Nurse Practitioner, Sherry has worked at pro-life clinics for the last 15 years, and is a speaker on topics dealing with emotional and physical healing.